India has historically had a role in Afghanistan and that ought to be recognised by Pakistan. Similarly India should accept that Pakistan, which has a 1,700 km border with Afghanistan, has to be on board for an enduring settlement. Pakistan Prime Minister Nawaz Sharif’s visit to the US came at a crucial time for both countries. Pullout from Afghanistan is around the corner and the Bilateral Security Agreement (BSA) with Kabul is still elusive. Afghans will elect a new President in less than six months. Talks with Taliban in Doha were stillborn and transition problems are yet to be sorted out. The scale of celebrations is directly related now to your spending power and it seems that it is only in poor or middle-class homes that festivals still retain the old ways and rituals. AS I write this, my mind is buzzing with tasks I have to accomplish before the end of the day. It is two days to Diwali and I still haven’t got my act together. Don’t worry, say my friends, just go to a Diwali mela (there are scores all over) and just pick up all your candles, diyas, Dhanteras stuff and clothes for the maids and driver as well — all in one place. Even though there are limitations of language and music, the Chinese have a deep regard for Indian classical dance, says the danseuse. Pratibha Prahlad, renowned classical dancer, was recently honoured by the media in China as the “most innovative and epoch-making artiste”. She says the highly stylised Peking Chinese Opera is akin to Indian classical dances because of the performance codes. Pakistan Prime Minister Nawaz Sharif’s visit to the US came at a crucial time for both countries. Pullout from Afghanistan is around the corner and the Bilateral Security Agreement (BSA) with Kabul is still elusive. Afghans will elect a new President in less than six months. Talks with Taliban in Doha were stillborn and transition problems are yet to be sorted out. A regional consensus on the building blocks of a stable post-2014 Afghanistan has yet to be evolved. For Pakistan this visit was a chance to revive an important relationship marred by mistrust. Pakistan saw in it a hope for reviving its economy through US investments in the energy sector and access to US markets. It desired a comprehensive and long-term relationship. 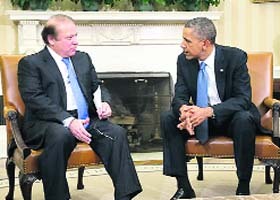 “US considers Pakistan a very important strategic partner,” said Obama in the joint press briefing with Sharif. Leaders tend to use sugarcoated expressions during such engagements. I have a problem in defining this relationship as strategic. A strategic relationship is based on convergence of interests. In this relationship some interests converge while quite a few diverge. A White House representative had earlier defined the ties as important but complex. That would be a more realistic classification. Pakistan’s role is hugely important for an orderly and safe pullout of personnel and equipment, smooth political transition in Afghanistan and a credible post-2014 setup that would obviate the possibility of its becoming a haven for terrorists once again. US President Barack Obama considers Pakistan an important strategic partner. For Pakistan, top priorities were a halt to drone attacks and reduction of energy shortages through US investment. It wanted a civil nuclear deal with the US and lifting of objections to the Iran gas pipeline so that international funding could come. While no progress is visible on these counts, the US has shown willingness to invest in the Bhasha-Diamer dam, a major hydel project. If the Sharif government can overcome the energy crisis, its future beyond 2018 would be greatly helped. Stoppage of drone attacks could facilitate a deal with the Pakistan Taliban, resulting in some peace and international investment. The US is the largest donor of military and economic assistance to Pakistan. While the US claims giving $25 billion in civil and military assistance since 2002, Pakistani material losses are far more, while human losses defy quantification. Soon after Sharif’s arrival, the US announced that aid worth $1.6 billion, stalled since 2011, would be released. The Department of State has requested Congress to approve an additional $300 million. These announcements aimed at giving the visit a positive start and to ensure that Pakistan would secure its western border, ensuring minimum incursions into Afghanistan. Sharif had a packed programme. He was feted to dinner by Secretary Kerry and had a breakfast meeting with Vice-President Biden. Address to the US-Pak Business Council was used by him to convey that Pakistan was a safe destination for investment and certain multinational companies were making big profits there. The meeting with Kerry was attended by Defence Secretary Chuck Hagel, National Security Adviser Susan Rice, CIA Director John Brennon and Representative for Pakistan and Afghanistan James Dobbins. This showed that for the US security matters were of paramount importance. The Obama-Sharif meeting, the final engagement of the visit, lasted two hours. The joint press stakeout did not indicate if the Indian role in post-2014 Afghanistan was discussed, but I would reckon it was. Without a regional consensus on promoting stability in Afghanistan, peace in that country would prove elusive. India has historically had a role in Afghanistan and that ought to be recognised by Pakistan. Similarly India should accept the fact that Pakistan, which has a 1,700 km border with Afghanistan, has to be on board for an enduring settlement. What Pakistan wants is a solid assurance that no threat to its security would originate from Afghan territory. Any proxy wars would be disastrous for the region. Time has come for India and Pakistan to cooperate on Afghanistan for the sake of regional peace. Sharif got an opportunity to project a new and democratic Pakistan that was open to international business. This Pakistan wants to emerge out of the security state syndrome that has stunted its growth. He wants a Pakistan of peace within, with Afghanistan and with India. He had the courage to own mistakes that created problems within Pakistan. He wants peace with the Taliban and the key to that is with the US. A halt to drone attacks could promote peace in Pakistan and enable it to secure its western border. An orderly withdrawal of foreign forces from there would bring a big peace dividend to the region. Sharif was the first Pakistani leader to visit the White House in five years. The fact that he embarked upon this visit with realistic expectations has helped matters. An inevitable question after every visit is whether it was a success or failure. I would put it somewhere in the middle. The US got assurances from Pakistan on cooperation in security and Pakistan got its assistance restored. They asked each other probing questions, many of which went unanswered. Diplomacy is the art of talking and communicating. Sharif may not have been as articulate as Obama but he did convey the Pakistani view. The trip augers well for peace and a process of re-engagement has started. AS I write this, my mind is buzzing with tasks I have to accomplish before the end of the day. It is two days to Diwali and I still haven’t got my act together. Don’t worry, say my friends, just go to a Diwali mela (there are scores all over) and just pick up all your candles, diyas, Dhanteras stuff and clothes for the maids and driver as well — all in one place. I suppose that is what I’ll do before the day is over but bit of me will die of guilt. Festivals are not what they were in our childhood. If you have the money and the means (that is, a fat purse plus a car and driver to take you through horrendous crowds and traffic snarls), that is how most people now do their festival shopping — one trip and all is done. I still feel that is cheating the gods and the occasion of a special feeling of love and care. No one I know makes paper lanterns, home-made sweets and savouries to be exchanged with friends, and ‘rangoli’ and ‘Lakshmi feet’ to greet the goddess when she comes at night to bless good homes. Why stop there? Does anyone believe in gods and goddesses at all except as exotic Barbie doll-like toys that have to be dressed up on festivals? We have handed over the charge of celebrating festivals to the corporate world that budgeons our brains with advertisements and special festival offers. Akshaya Tritiya, Dhanteras, Bhai Dooj, Raksha Bandhan — all are offered as attractive gift packages. You can send Indian mithai to NRI brothers and children at the press of a computer key, so why bother about sending parcels sealed with lac (remember those ugly bundles we sent via sea and airmail?) What is even more alluring is that you can eat a special vrat thali that has all the goodies that you have forgotten how to cook without the hassle of slaving all day. Are we cheating the gods? Oh yes, modern amenities have eased the burden of such time-consuming tasks and liberated busy working men and women for doing other, more important things. However, the scale of celebrations is now directly related to your spending power and it seems to me that it is only in poor or middle-class homes (preferably with a Mataji in residence) that festivals retain the old ways. Sad as some of us may occasionally feel at this mutation of festivals into orgies of spending, eating and drinking, we must acknowledge it is no longer possible to retain those rites and rituals that have no place in the busy world of today. Perhaps individual celebrations will implode into community celebrations, and as has happened with Durga Puja and Ganesh Chaturthi, festivals may bring people together in a spirit of bonhomie and celebration that transcends caste and community. My sociologist friends tell me that the fallout of rapid urbanisation in the wake of migrations from rural to urban India is a quiet revolution that many parties have not factored into their political calculations based on caste-based vote banks. Caste boundaries mean less in cities than in villages and may slowly translate into a more egalitarian social structure. After all, when you sit next to someone in a bus or train, you do not perform a caste-check before settling down. Similarly, a teashop or a ‘dhaba’ serves everyone with the same food eaten off the same plates. When looking for a place to sleep on the pavement at night, can you risk asking the man sleeping next to you what caste he belongs to? Exposure to these situations will certainly change mindsets, say such sociologists. If that is true, then how can one bemoan the loss of the older ways of celebrating festivals that were ridden with taboos and prejudices carried down generations? Legislating social reform changes little, if anything at all, as our country has seen. Our Constitution is among the noblest in the world, with freedom of speech, movement and opportunity to men and women alike. Despite the written law, we all know exactly how little has changed in over six decades. This is why I have great hopes of the quiet social revolution that rapid urbanisation promises. Which town or city will tolerate a khap panchayat, I ask you? You can depend upon the local women’s group to hold a nukkad meeting and shame the man who will not allow his daughter to marry a man of her choice. It will happen, I know because I have seen young girls and boys of our neighbourhood respond to appeals for civil behaviour. As the tyranny of caste-based politics and ritual-bound religion recedes, a more sane, just and egalitarian society will be born. 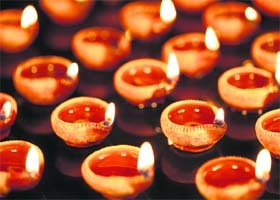 So, as I wish all my readers a joyous Diwali, I must sign off to visit a Diwali mela. 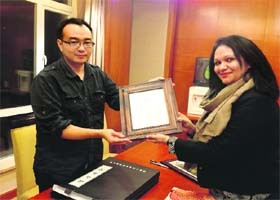 Pratibha Prahlad being honoured in China. What is your experience of dancing before a Chinese audience? What is the level of appreciation of Indian classical dance? The Chinese are interested in Indian classical dance. They understand the complexity of the dance form and the classical codes that govern it. Even if the language, music and stories are alien to them, they have a deep regard for Indian dance. My group was invited to the International Intangible Heritage Festival in Chengdu in June and International Country Music Festival in Zhangjiajie in August. Does Chinese culture make them receptive to the nuances of Indian classical dance? China is an ancient civilisation like us. There is a huge variety of performing arts tradition. Different dynasties that ruled China patronised different art forms. The Peking Chinese Opera is unique to China in its theme, costume, performing methodology and treatment. It is similar to our classical dances. Appreciation of Indian performing arts is more among an oriental audience or a western audience? I have performed in several countries over the last 25 years. I have performed more in the US, UK and Europe than in the East. If you do what you do really well, are a genuine artiste and love what you do, you transmit that love to your audiences. I have experienced the respect and awe audiences all over the world have for Bharatnatyam. In many festivals I have performed with artistes from several countries and have had the maximum applause and fan following. The other artistes have also become my admirers after watching my performance. I think it has to do with the majesty of Bharatnatyam as an art form. It is a composite dance style that gives one a glimpse of ancient India and takes one on a journey of ancient values and ethos. Many westerners learn Indian performing arts, but it is not so with people from the Far East. As a country, we opened up to the western world sooner than we did to the East. Our focus was on the West for a long time. We wanted western endorsement for everything, including our art forms. If artistes became famous in the US or Europe, they were considered achievers in our country. All first-generation post-Independence artistes like Balasaraswati, Kamala Lakshman, Padmini, Ali Akbar Khan and Ravi Shankar went to the US and set up schools there. Therefore, we have a great many westerners practising our art forms. People from Japan, China, Malaysia and Singapore come to India to learn the art forms. Now several of them have opened institutes in their countries. Sitar and sarod have got a good following in the West. Do Indian classical dance forms have the same potential? Indian dance is already very popular in the West. In fact, in the US, UK and parts of Europe, they are featured in mainstream festivals. Did tension between India and China ever cast a shadow on your performance in China? Surprisingly, no. There was no trace of any tension. I believe the tension is a creation of the media. It has nothing to do with the civil society in both India and China. We were welcomed, applauded and treated with great respect and awe. You talked about investments being made by China in culture. Is India lacking in this respect? India is a natural, cultural superpower. The depth and diversity of art forms in India is not found anywhere in the world. We have performances everywhere on all occasions. But time has come to put our tangible and intangible cultural heritage in the forefront in a concerted, planned manner to make it attractive to mass audiences. How we do it is a challenge as despite talking of public-private partnership, when it comes to cultural promotion, it is only the government that has to invest. Our corporate houses have no cultural responsibility and do not promote cultural festivals and exchanges. They do it only when some higher-ups in the government tell them to, or when they see a business opportunity. In India, foundations that support the arts are miniscule. Also, there is no dispassionate evaluation, thought or process in funds disbursement for festivals. Therefore, a festival as large and diverse as the Delhi International Arts Festival has to still go begging for funds, despite making a name for itself in the international festival arena and making Delhi a cultural destination. Which foreign art forms appeal to you? I am a classicist. I love classical ballet. I enjoy classical music, be it Indian or western. Of late, I have witnessed top-class performers of flamenco. Theatre and opera are other forms that I enjoy.